The Council is planning to pass a by-law that that would ban rough sleeping and prohibit soup runs from operating in a designated area around Westminster Cathedral. If approved, the by-law could be in place by October. will be torn up if these proposals go ahead. Revd. 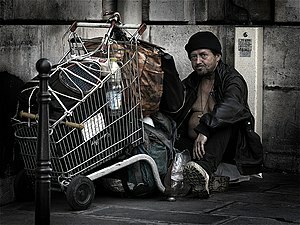 John* writes: “James, aged 49, sleeps behind a shop between the bins just off a main high street in East London. I chat to him when I see him and occasionally we go to where he sleeps for some more privacy and pray. He won’t come to the church – I think he doesn’t feel he will fit in or may even be ashamed of how he now appears. James lost his job with a small engineering firm 3-4 months ago due to cut backs. He then split up with his partner and lost his home. As he is single and without dependent children he is not a priority to be housed. About twenty-one years ago I spent a little bit of time working with the homeless in London, at the Whitechapel Mission, a Methodist Church on the City Road. 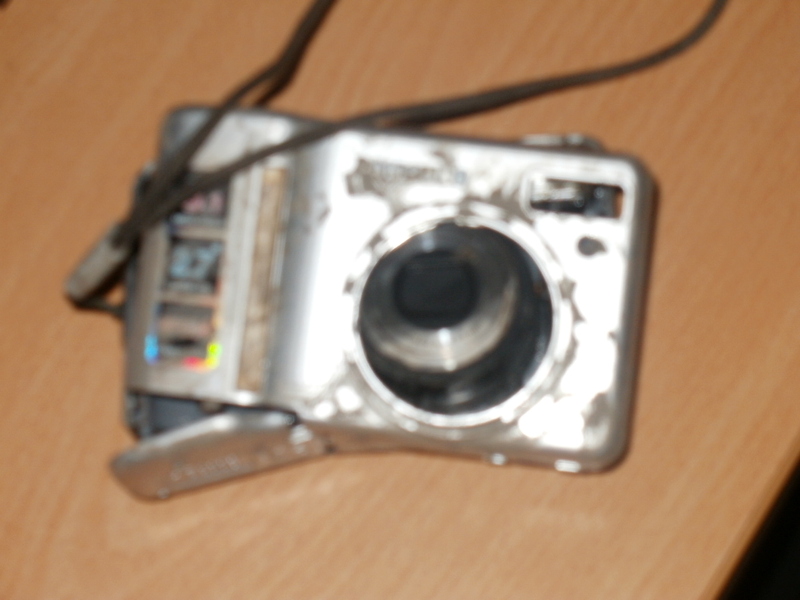 At the time I didn`t really understand the issues surrounding homelessness but what I saw will stay with me forever. This is an absolutely DISGUSTING decision and it makes me ashamed to be British. Where are the homeless to go ? Westminster City Council aren`t addressing the problem but are simply moving it onto someone else as if the homeless are simply `bodies` to be moved along. I long for a government who seek to address the greater issue of what is the cause of homelessness, but this government (as others) are simply seeking the short-term “lets hide the issue” response ! I don`t know what we can do except lobby our MP`s who might not be able to influence Westminster City Council but who can raise the issue in Parliament and in the Governments hearing. We can also commit this to prayer for I believe in a God who values ALL human life and despises the injustices and inequalities of this world. We need to commit the situation to Him. Well, we’ve now completed our two days of Scriptorium. As I said before the Methodist Church is creating a handwritten Bible prepared by people all over the country and expecially (hopefully) people who wouldn`t usually engage in anything to do with the Bible under normal circumstances. 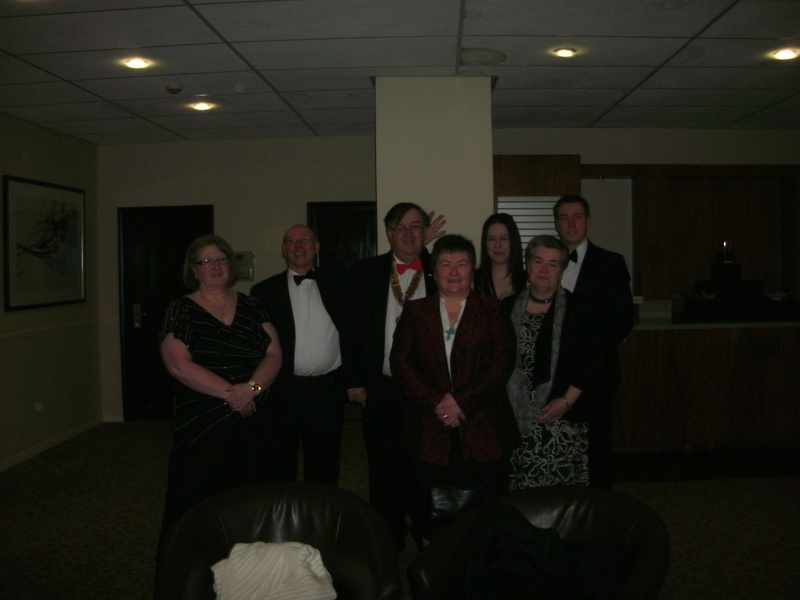 Here are a couple of photographs from both events. Don`t know how well this will work. If it doesn`t it can also be found on my facebook page. 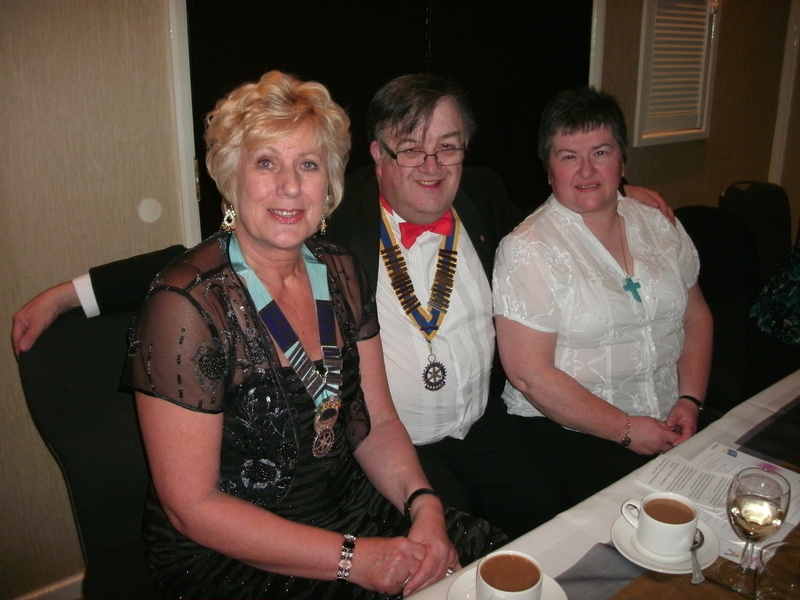 Regular readers of this blog will know that I am the President of my Rotary Club (West Ashfield) for this year; last night was our 2011 charter which was also our 25th since we began. The club charter is in effect our birthday `bash` when we all get dressed up, eat too much, drink (hopefully not too much !) and have some good quality entertainment. When you`re President it is usually regarded as your special night and as I had recommended the entertainers the pressure was on for it to be right. 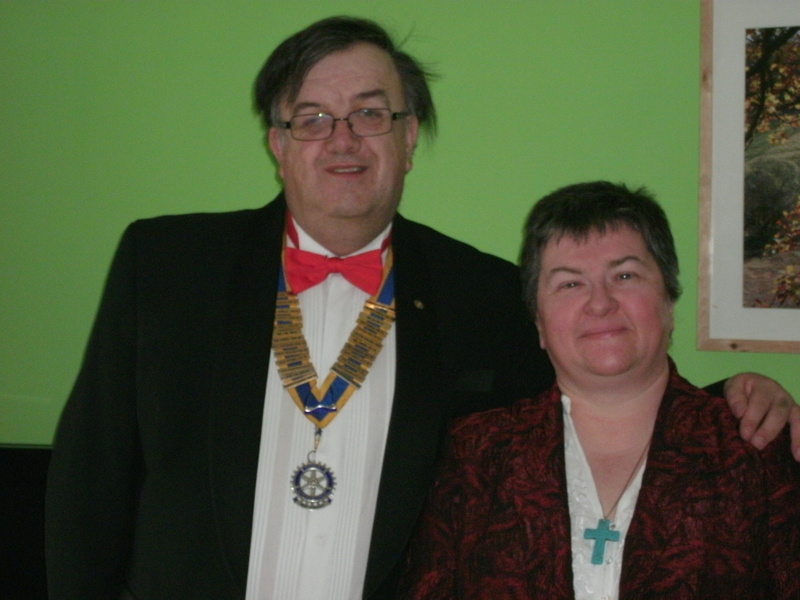 Well, the food was good (at the Derbyshire Hotel, Jct 28 M1) it always is, the service to 105 people was excellent, speeches were suitably short (thankfully) and the entertainment of Jonathan Panton and Hilary Leam was absolutely spot on. Jonathan has appeared in West End shows professionally and next month starts a new season at the West Yorkshire playhouse. Hilary has spent many years semi-professionally singing in a band (I believe) and also solo. They are two very good friends and they put on an amazing evening of top quality entertainment. They were so good that they allayed all my fears about whether or not I`d done the right thing. One or two thought that the sound was a little too much but everyone else was simply full of praise and many remarked that it was the best charter they had been too. It was certainly the first one that I had attended where there was a standing ovation at the end of the entertainment, instead of the usual rush to get out at the end of a long night. As you can imagine I`m feeling rather elated and extremely proud this morning. Combined with staying at the hotel overnight, having a relaxing morning and breakfast this morning (Sunday off) and a lazy afternoon today this is proving a special weekend. On top of all this I was delighted that not only Alison, but Vikki, Rebecca and Tom were there and they did me proud. I was also privileged to have had Jim and Jane (my co-superintendent), Judith from Oldham, and Alison and Stuart Wood in attendance as well. Even last years President Graham, his wife Tina and other friends travelled all the way from the Isle of Wight to be there. I feel quite honoured. As I said in my speech last night Rotary has given me the opportunity to play a small part in having a practical effect on people’s lives; the eradication of polio is almost complete thanks to Rotary, we have supported local schools and Shirland Miners Welfare training band from our own area, Poiana in Romania and the ongoing Tibshelf school project in Sri Lanka. Over the years we have had school governors, carried out mock interviews, looked after overseas visitors and given them a cultural experience (Mansfield ?????). In many ways it doesn`t seem much but Rotary International has given me a chance to be a part of all this, and to try to make the world a better place. Good friends, good food, good fun……………………..what a great way to spend an evening. I`ve just finished printing out chapters 6 and 7 of Ezra for our handwritten Bible project which begins tomorrow at Blackwell Community Centre and continues at the Idlewell Shopping Centre, Sutton on Saturday. Please hold us in prayer. What is the handwritten Bible project ? 2011 is the 400th anniversary of the King James Bible and in conjunction with the Bible Society (Biblefresh initiative) our annual Conference resolved that Districts would work collectively to handwrite the Bible during the course of this year. Every District and Circuit has been allocated a portion of Scripture to write out and the idea is to creat a “Bible of the people”. Consequently we have been encouraged to go beyond our Church walls and seek innovative ways to achieve this. In the Borders Mission Circuit we are holding two events, first one tomorrow and the second on Saturday. Tomorrow we have been allowed to `hijack` the Blackwell residents action group coffee morning which is held every Tuesday and Thursday; I will be allowed to have a table at the top end of the room with my lectern and I will simply sit and await anyone who wants to come and copy out a verse of Scripture. I give a lot of thanks to the people of Blackwell for allowing this to happen. No one will be pressured into this and I hope that the Churches will turn out to support the coffee morning, as a thank you for allowing this to happen. I also hope and pray that it will give an opportunity for me to speak to folk about Scripture. Similarly, on Saturday, we are going to the Idlewell Shopping Centre in Sutton. This is a very busy shopping centre and again we`ll simply put out the lectern and allow passers-by to take part. Should we have any verses left after this we will have plenty of time to complete the exercise elsewhere before we have to send it off. What will happen to it after that ? Well it will be presented to the Methodist Conference in July 2011, but after that who knows ? I know of various suggestions that have been made including a presentation to the Queen, but what her Majesty will do with approximately 8000 sheets in 20 hardbound volumes I do not know !! All in all it is an exciting project and I find myself really looking forward to tomorrow Those of you who are on the Borders Mission Facebook page may get to see quite a few photographs of this event. For others I will try to put one on here tomorrow night or after Saturday. Most importantly pray for the events, that Jesus may be glorified. 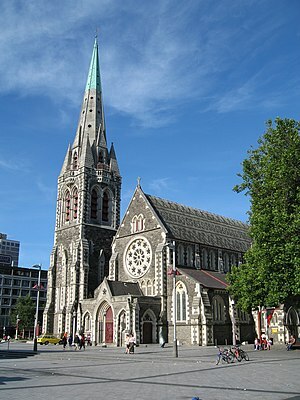 Please hold the people of Christchurch in your prayers today after the terrible earthquake. Picked this up on my Facebook account earlier today……………………. What a great message because it points out the importance of Scripture. I find it fascinating that so many Christians can revere the Bible, declare that it is the book they live by and yet very few ever read it on a daily basis. I don`t know the current statistics but certainly 10 years ago the Bible Society were noting that less than 17% of practising Christians read their Bible on a daily basis ! This year the Bible Society are acknowledging the 400th anniversary of the publication of the King James Bible, and are using it to encourage all Christians and members of society to begin to engage with the Scriptures afresh. This initiative is called BibleFresh and they are hoping that there will be many creative and innovative ways of raising the profile of Scripture. It doesn`t matter what version of the Bible people use, but this is simply an encouragement to read the book that Christians proclaim to be the primary revelation of our Lord Jesus Christ . 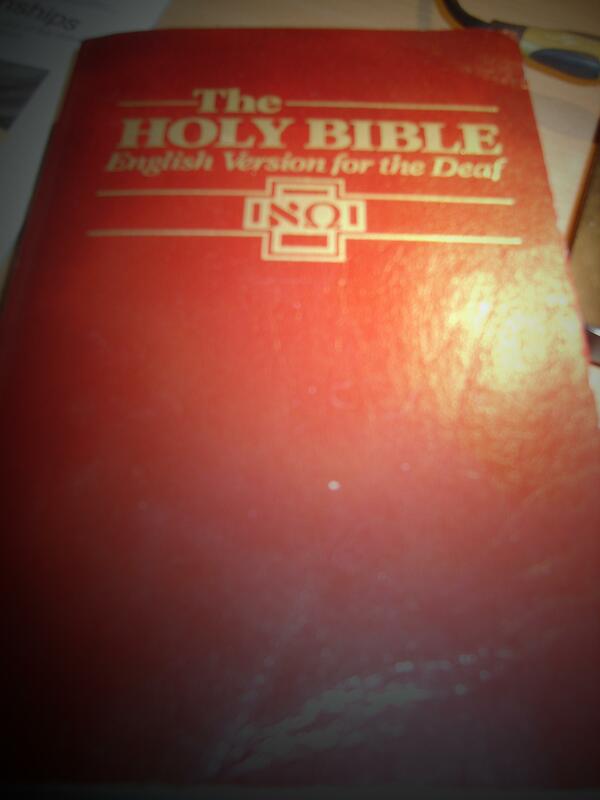 My own preference varies depending on why I`m reading the Bible and perhaps on what I`m hoping to gain from it, (at the moment I`m using the English version for the Deaf, a particular favourite); but whatever version I use there are three things which I think are important and which I always encourage people to do. 3) Prayer after reading the Scriptures that God would show you what to do about it. I believe that if we can read the Scriptures with more expectancy then we are opening our minds and hearts to the possibility that God will speak through them and show us the way forward for our lives and then the little quotation I put at the beginning of this article will be so very true. 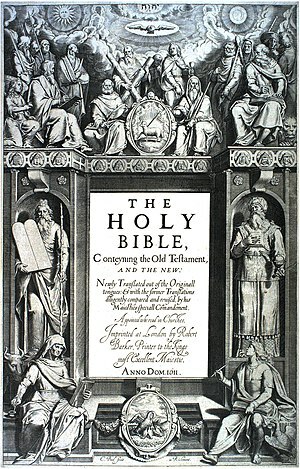 Why not give it a go; look up the BibleFresh website http://www.biblefresh.com/ and see if it can help you to revisit the Bible.